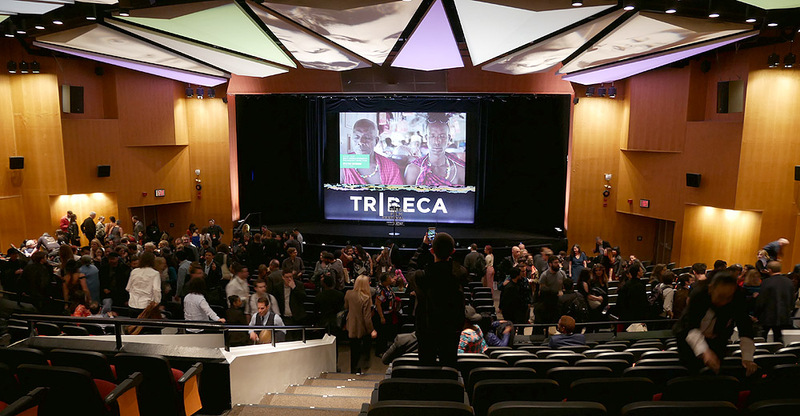 Tribeca Film Festival 2018 wrapped April 29. And the WORD is wrapping up its coverage. Q&A Segments Edited for Style. 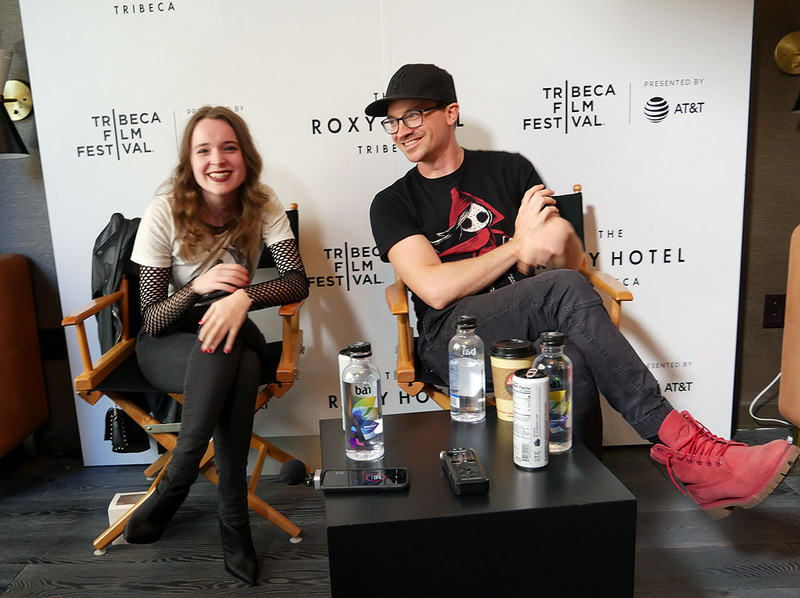 Editor’s Note, a Heads Up: Lower in this Q&A, Director Justin P. Lange and Actress Nadia Alexander, the 2017 Tribeca Film Festival Best Actress in a Narrative Film, discuss their next projects. Hint: They are on a roll! LET THE RIGHT ONE IN (2008) is a Swedish horror film about bullied 12-year-old Oskary, played by Kåre Hedebrant, who develops a friendship with a child like vampire, Eli, played by Lina Leandersson. The original Swedish name was Låt den rätte komma i. The movie is based on the novel by John Ajvide Lindqvist, who also wrote the screenplay. Director Lange said in a Q&A with this reviewer during the recent Tribeca Film Festival that the movie was inspiration for his tour de force, THE DARK. Justin P. Lange: That movie was a gateway movie for me going into horror in the genre world, and I loved it. But there was always this nagging thing where I would say, what would this story be if we were with Eli, the vampire, and she was the main character? It wasn’t, we’re with the human looking at the vampire and saying we have this safe distance from her in a way where she’s different, but we’re still with the boy who’s just a boy. Truth be told, I stumbled in the Q&A with THE DARK’S Nadia Alexander, who played the ferociously feral, flesh eating Mina and with Lange. It was as if the left and right hemispheres of my brain were in fierce conflict for the answer, answers I was seeking to the big question gnawing at me: How did he pull off this masterpiece? It was as if he had created his own horror movie sub-genre. I struggled not to gush and fawn all over them but as I did, I blathered. In fact – a major faux pas here and I really struggled – there came a time when I was more interested in telling them how much I luv-ed the movie than I was about eliciting answers about their take on cinematic marvel they pulled off. That had to do with the lingering effects of my seeing THE DARK a second time just before the interview. For the sake of narrative clarity, I’ve edited out the most egregious gushing passages. I was expecting them, especially Lange, to confirm what I believed were the audacious creative features of his film, such as a ferocious preternatural creature – he said “monster” in the interview – that many if not all in audiences would eventually empathize and sympathize with despite her ax wielding carnage. That happens because of the power and eloquence of his story telling. The killing scenes were very scary and nerve wracking but Lange, who obviously is not afraid of gore, didn’t rely on lot of gore for the horrific scenes. This was one of those movies I knew I would be seeing over and over because I felt/feel there might be other discoveries to be made. I imagined that I had sensed, witness, saw, perceived things that other reviewers had overlooked or had misunderstood, especially regarding the metamorphosis happening with the monster. Note: Nadia Alexander in person is really, really funny. Both the director and his key character are intense but in different ways. Nadia Alexander: I love that microphone. It’s so cute. (The reviewer was setting up his recording equipment. It’s like a little ball … (the microphone to my iPhone 7). Interviewer: Oh, I can tell you my big question. It’s a good thing I saw it a second time. It looks like a fairy tale wrapped in a horror movie or a horror movie wrapped in a fairy tale. There’s that transformation through the movie when you (Alexander) get up, okay, and then later on with the … I’m not doing this in order, but with the cigarette lighter … The first time doesn’t bother you, the second time it burns you. And then are other little things like that. And then in the beginning, you’re really gruesome. But then towards the end, it’s just someone who has very bad scars. Am I seeing this as you (Justin) (intended)? Interviewer: The other reviews (at the time of the interview) were writing about the undead. She didn’t look dead. I mean she came out of the grave, okay. It’s very artistic because a lot of people are going to see this in different ways, but this has a happy … I am not going to say this in the review (as a spoiler) – but this has a happy ending. It’s almost religious … or mystical.” (Justin had a sharp negative reaction to my use of “mystical.”) I’m glad I saw it the second time. It was great the first time, but I had all these things nagging at me and nagging at me, so I had to go see it a second time. I thought, Wow! Your scenes are so powerful, so mesmerizing. Nadia Alexander: Go for it! Interviewer: I’m going to shoot as I’m talking. About this this point in the Q&A, Justin is describing how LET THE RIGHT ONE IN inspired him for this movie. Interviewer: Yes! (I liked the anti-bullying theme as in bullies play a bloody price in this flick). Justin: … movie was a gateway movie for me going into horror in the genre world, and I love it. But there was always this nagging thing where I would say, What would this story be if we were with Eli, the vampire, and she was the main character? It wasn’t we’re with the human looking at the vampire and saying we have this safe distance from her in a way where she’s different, but we’re still with the boy who’s just a boy. It was something, every once in a while, I’ll have an idea like that where it’s like I’ve never seen that and it excites me as a film maker. I want to do things that haven’t been seen and feel different. Once that clicked in my head that was the goal, and the next step was finding the monster … find the monster that I could write, that I could feel that righteousness about … yes, there are these questionable, awful things that’s she’s doing, but also, there’s a reason for it. There’s a common thread in a lot of films that I’ve done up until now and have dealt with abuse. Justin Continues: When I found Mina in that situation and that backstory, I was with her every step of the way. It just catapulted me into the writing of the film where I sympathized with her and as long as I do then I believe that I could make other people do it as well. Then it’s all just part of the process to find the right actors as well. Interviewer: The acting was superb … was out of this world … It was like every character was picture perfect (for the role he or she was in). Those two elderly guys (early in the movie) where the serial killer (stops at a service station) … Wow! That kind of stuff that was going one (referring to the bantering back and forth between the owner and the driver of the car) … I couldn’t remove my eyes (from the screen) … because it was so good. Nadia Alexander: Yeah, Definitely it was a big challenge for me. I think it was a little intimidating cause I was standing at the bottom of a mountain and looking up and going, Oh, I need to climb now in six weeks? Oh, okay, I’ll try. It was the first time that I ever fully led a film. I had a film at Tribeca last year called BLAME (she won Best Actress, U.S. Narrative Competition) in which I was one of three leads so I could rely on the other guys to do their jobs and I’ll try to do mine, but this one you are basically with me the entire time so I felt a great deal of responsibility to Justin and to really serving the story so I put some pressure on myself. But that is what I used that was my tome of writing all of that and then of course, you can decide when you throw it out the window and you try to be in the moment and alive and with Toby and with … but there were also a lot of private scenes so it was important for me to have that deep understanding of Mina so that all the silent scenes, even if it was just going through someone’s pockets or roaming through a car, you know, understanding what was driving that at all times. That is what I did. Justin: I’m working on a film called [tape distortion, I think he said something like Theresa] with the same producers of THE DARK. It’s another take on horror. and inspired by [tape distortion but it sounded like he said Carrie], as in Stephen King’s Carrie and directed by Brian D. Palma.] It’s about these two estranged sisters who come from a rough, repressive home and one of them escaped and one of them didn’t and they reunite and things get violent. That’s still in development and hopefully we’ll shoot that within soon. Justin: Yeah, in regard to what’s happening with THE DARK. It will continue to have a festival life. It’s playing at Fantaspoa in Brazil in May and then some other festivals that haven’t been announced yet. Hopefully it will find a home with distribution and more people will get to see it and we’ll keep the conversation going and that will be great. Nadia Alexander: For me. I have another genre film that’s coming out in August called BOARDING SCHOOL which is directed by Boaz Yakin who did REMEMBER THE TITANS and THE UPTOWN GIRLS and it’s a psychological thriller that takes place at a boarding school and it’s another prosthetic film, so I did 3 1/2 hours of prosthetic makeup every day to become a 14-year-old boy. So I play a boy which is really different and interesting. I’m excited to see … I haven’t seen it yet, so I don’t know if I’m any good at a boy, but it was interesting process and I did it right before we went to do THE DARK. Nadia Alexander: And then I’m also writing. I just sold a grounded sci-fi, feminist mini-series. Nadia Alexander: Yeah, it’s a mini-series. It’s a six episode anthology series and it’s doing really great. As an actor, a lot of time we have very little control over our lives so working on writing has been really rewarding because I get to make my own schedule and get to develop different ideas. I’m working with a co-author who I love … yeah, it’s really fun for me to try new things and do new stuff. That’s what being alive is all about, right? Am I right? Right! Justin: There are lots of challenges. Everything is different … Something I love about film making is the problem solving aspect of it. It’s where I feel at home. You get problems and you figure out a way to stay focused and say the thing you want to say and find the things that are essential. Ultimately, for a first feature, I think the hardest part is finding the resources. That’s always going to be a problem, but we were able to make it work. And, then … you know, probably. Nadia Alexander: Justin likes the challenge on THE DARK … I think the biggest challenge for me was probably the balancing because this was the first big league job that I’d ever done and it was balancing the stress and the pressure that I put on myself to do my absolute best with also getting enough sleep and feeling good about myself. It’s always hard when you really want to push yourself … Anytime you feel even a little bit disappointed it just feels like, Oh, no! I’ve ruined the whole movie because that one scene in the bathroom I didn’t do enough with my face … You put a certain amount of pressure on yourself … and navigating that and being up in the middle of nowhere … Canada … and having that kind of isolation. You know, it can be a bit of a challenge to stay sane. But it was six weeks, so after that I was fine – that and lots of therapy.